Pine needles have virtually no caloric value. I would not recommend pine needles as an energy source, although they have plenty of vitamin C and make delicious tea. This is good in winter to avoid getting scurvy in a long-term survival situation. 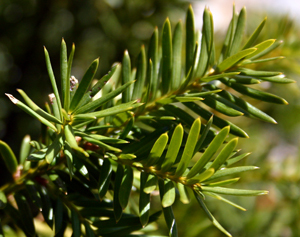 As already mentioned, Yew needles are toxic to the human body. There are several genera of yew. Generally they grow at higher elevations and in man-made parks. All pines, spruces and firs have edible needles. All yews are poisonous, and can look like some of the above, so be careful you have identified the tree correctly! Yes & no. The U.S. Navy land survival training in Pensacola, Florida teaches students to chew on pine needles to obtain vitamin C. But you don't actually chew and swallow them. In the spring you can commonly find delicious new shoots on spruce. They are quite good as a snack when there are no other significant sources of food to eat, or perhaps on a hike. The resin has alot of calories. On a video called how to eat a pine tree I think they said 2000 calories in a teaspoon full. In a museum in hungary they said the shephards used to put it on their teeth from where it comes off slowly and it gave them energy to walk all day. Not the answer you're looking for? Browse other questions tagged survival emergencies trees plants edible or ask your own question.